Debate about the teaching of history is never far away. The former Secretary of State for Education, Michael Gove, has sought since 2010 to reshape the history curriculum in schools by bringing in more coverage of British history and altering assessment techniques. His plans met with some serious resistance – including from academics and school teachers. The key areas of debate echoed those raised 25 years ago when a national curriculum for history was first introduced. The terms of the debate are also recognisable in contestation about the teaching of history in the late nineteenth and early twentieth centuries. What are the aims of history teaching? Should politicians dictate the content of history lessons? What does the selection and omission of certain content reveal about the kind of national past we want children to grow up knowing? Should history be considered a conduit of citizenship education? Is there a direct correlation between the teaching of history and national identity? What influence should be given to specialist experts working in the educational sciences? What should be the relationship between the teaching of ‘facts’ over skills of historical enquiry and interpretation? These debates – hostile and unresolved – are not new. The teaching of history has always been a topic for serious dispute. This was especially so in the period in which historical content was first taught as a compulsory component of the curriculum in the nation’s schools. In the late-Victorian period, educational provision was made compulsory and free and, given its vast cost, it is no surprise that contemporaries argued over its social and political functions. In the context of late-Victorian anxieties about the future of empire, it is little wonder moreover that the teaching of history specifically should have been the subject of such contentious discussion. Britain perceived itself threatened on two fronts: externally, she was concerned about the growth of economic and imperial competitors such as Germany; internally, the rise of an organised political Left coincided with fears about children’s emotional, moral and physical wellbeing. The combination of these factors meant that the teaching of history was prescribed, by some, as an antidote to a perceived crisis of national confidence. In such a context it is clear those seeking to promote ideologies of imperialism and patriotism saw in the teaching of history the opportunity to inculcate imperial values. To what extent was their influence the most significant? What were imperial ‘values’ and how was history intended to deliver these in a classroom context? These are just some of the questions that this book investigates. The introduction of mass education also brought to the fore questions about how to teach. The late nineteenth century was also a period of deep-reaching investigations into pedagogy. Although there have been several studies into histories of history teaching, most have tended to focus on the content of resources used in the classroom – especially subject-specific history textbooks and historical reading books for younger children. But what of the sources used to instruct a new generation of teachers how to teach? ‘Manuals of Method’ have received less attention from researchers than they merit: these sources are valuable because, as a distinct genre of educational publishing, their authors are those who taught in teacher-training colleges, influenced the production of classroom resources, and were some of the loudest voices in debates about history teaching. In the absence of centralised state regulations on what history to teach, and how to teach it, these manuals serve ostensibly as documents of best practice. The study of these sources reveals that the intentions behind history teaching were far more complex than previously acknowledged. In addition, evidence from manuals exhibits the debt British educationists owed to continental educational theorists – in particular a little studied group called the Herbartians who came to dominate. Herbartians emphasised the centrality of history – as a subject that would mobilise the emotions – to the teaching of civic and moral values. These values, in turn of the twentieth-century England, could be made to tally with wider national and imperial objectives. In the book, I explore the extent of the Herbartian dominance of the curriculum. It appears that history teaching only became such a vital part of national-identity teaching because its teachers embraced cutting-edge educational psychology. We seem nowadays, with the state’s emphasis on facts over skills, to somewhat have reversed the ratchet. Parallels with current disputes about history education are acute, especially so since the ‘history’ of history teaching is often mobilised in both sides of the debate. 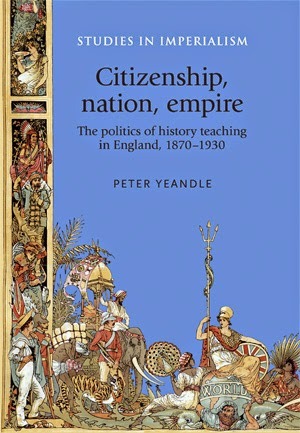 This book, therefore, aims to provide a history of the relationship between history teaching and pedagogy, and an investigation of the wider implications of this in debates about the contribution of history teaching to popular imperialism, citizenship, nation and identity.